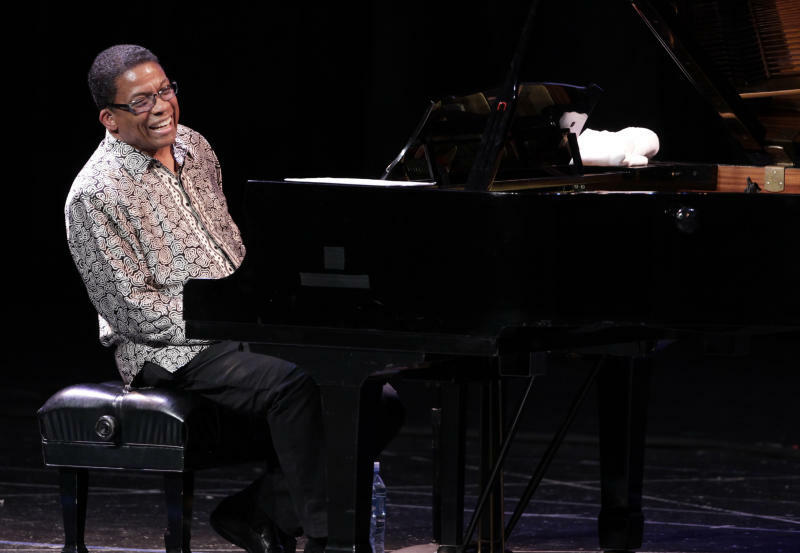 NEW YORK (AP) — Herbie Hancock reckons he's performed more often in Japan than in his hometown of Chicago during his professional career. The pianist will be back next month for an all-star concert at Osaka Castle Park highlighting the third annual International Jazz Day. The United Nations Educational, Scientific and Cultural Organization has chosen Osaka as the host city for International Jazz Day 2014, which will be celebrated around the world on April 30. Hancock, a UNESCO Goodwill Ambassador, says it's an opportunity to show appreciation for Japanese jazz fans who have been among the world's greatest supporters of the music. He first performed in Japan with Miles Davis' quintet in 1964, and has toured there with his own electric and acoustic groups for decades. "Japanese audiences are very loyal," said Hancock, interviewed ahead of Tuesday's official announcement of the International Jazz Day program. "In Japan, art is really placed on a high level, and jazz is really honored and accepted as being a fine music — much more in comparison to the States." Osaka was chosen as the host city because its jazz scene dates back to the 1920s and remains lively today, said Tom Carter, president of the Thelonious Monk Institute of Jazz, who is partnering with UNESCO Director-General Irina Bokova to present International Jazz Day. "Osaka has played a leading role in the early days of jazz in Japan and in Asia," Carter said. After American and Filipino bands introduced jazz to Japan, Japanese musicians began playing jazz in Osaka's dance halls. They included trumpeter Fumio Nanri, who toured the U.S. and was dubbed the "Satchmo of Japan" by Louis Armstrong. During World War II, the government unsuccessfully tried to ban jazz, but the music flourished during the American occupation. "I was introduced to jazz while playing in a dance hall as a teenager during the American occupation by a Japanese jazz fan and record collector. He played Teddy Wilson's 'Sweet Lorraine,' and I was hooked," said pianist-composer Toshiko Akiyoshi, who will be performing with her husband, saxophonist-flutist Lew Tabackin, at the Osaka concert. Akiyoshi, who came to the U.S. in 1956 to study jazz, gained worldwide acclaim first as a bebop pianist and later as the leader of her own big band, often writing compositions that drew on traditional Japanese music. The International Jazz Day celebrations will kick off at the Osaka School of Music with a daylong series of educational programs, panel discussions, film screenings and dance performances. The festivities conclude with a free outdoor concert for up to 12,000 people in the park set against the backdrop of historic Osaka Castle. It will be live streamed worldwide. The lineup includes such jazz stars as Hancock, Wayne Shorter, Kenny Garrett, Dee Dee Bridgewater, Gregory Porter, Roy Hargrove, Marcus Miller, Esperanza Spalding, Earl Klugh and John Scofield. Veteran Japanese trumpeter Terumasa Hino, who will be among the performers, hopes Jazz Day will rekindle interest in jazz. "I hope that this year's event in Osaka provides a spark for young Japanese people to get to know jazz and enjoy it," he said. Hancock said International Jazz Day has "gone beyond our wildest expectations" since its launch in 2012. UNESCO said Jazz Day events were held last year in all 196 member countries despite political, financial and security challenges. The organizers reached out beyond official organizations to work with hotels and restaurants, embassies, schools and musicians. In Damascus, Syrian musicians gathered to screen the global concert live from last year's host city of Istanbul, Turkey. In the new country of South Sudan, a cafe in the capital, Juba, organized a jazz performance. In the Pacific Island nation of Nauru, a radio station broadcast jazz throughout the day. "I was deeply moved talking to many of these courageous people who are trying to keep music alive," said Mika Shino, the Monk Institute's Director, International Jazz Day Program and Global Outreach. "So many people, in places like Niger, Mali, Myanmar, Iran and Iraq, thanked us for recognizing them as someone worthy of partnership. They get plenty of calls for interviews to talk about poverty, conflict and war, but never about including them in a global celebration."